Took a little longer than expected to arrive, but overall this is a nice and simple charging station that helps reduce the look of clutter. I would definitely recommend it. 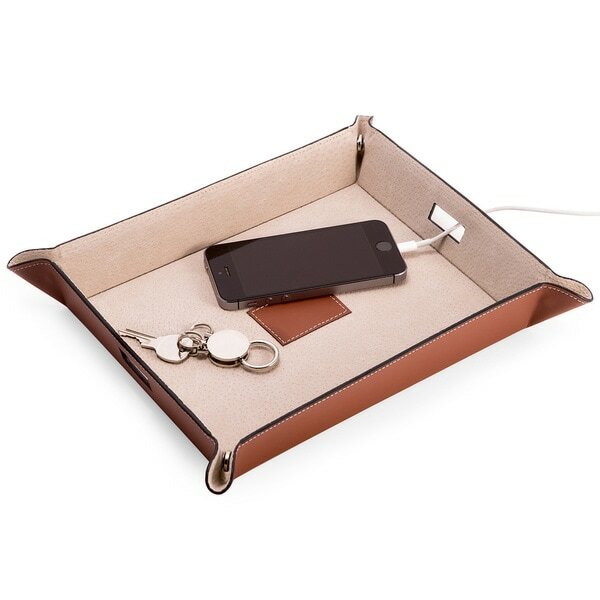 Store your valueables in this leather valet that features pigskin lining and a charging notch, making it a convenient catch-all. this was a great Groomsman gift if anyone is looking for something like that. Good quality and unique. Just what I wanted for the man who has everything. Very nice leather quality, convenient and easy. My husband really likes the trays I purchased for him! It looks perfect for organizing all the things that are currently all over the headboard of my bed. Bought as a gift for someone who is hard to buy for. I love the black one and won't show as much dirt. This is a great gift to put all your item when you walk in the door.